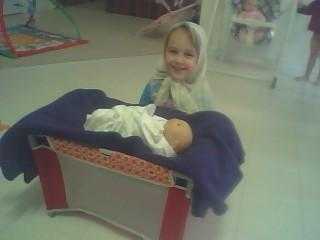 Yesterday “The Ladies” were playing “Mary, Joseph and Baby Jesus.” They were dressed up in “middle-eastern” garb (aka blankets over their head) and had a small manger complete with “Baby Jesus” sitting right in the middle of our living room. When I came home, I was invited to play the role of the witch who stole the baby. You remember that part of the story, don’t you? Seriously, I’m not sure where they learned that (hopefully it wasn’t Pastor Alex), but in the spirit of the holidays I played along… and stole the baby. I cackled like a witch and stole the baby (in case you’re wondering, Baby Jesus is a cabbage patch looking child and fits quite comfortably under our couch). The witch of financial stress. The witch of relational stress. Play with your family or your friends. That’s right. Just take some time and play. Give something to someone. Give an offering at church. Buy someone a meal. Adopt a family at a local mission. Sing a song. Oh come on Scrooge! You can sing a song and when you do you’ll be surprised at what begins to happen in your heart! What would you add to this list? Figure it out, do it and get the joy and love of Jesus back into your holiday season!